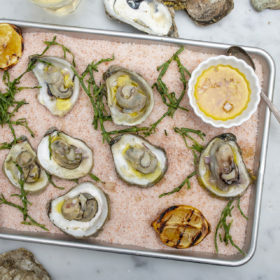 Time in a wood-fired oven, along with a rich and spicy kimchi hollandaise, make for a truly unique way to enjoy oysters on the half shell. At Fish & Game, the staff uses a homemade kimchi of daikon greens and bakes the oysters in a wood-fired oven. Shuck oysters, leaving them in bottom shell with liquid. Arrange in rimmed baking sheet on bed of coarse salt, to hold them steady while you make Hollandaise. Put egg and yolks in blender. Heat butter and brine in saucepan over medium heat. After butter melts, whisk mixture and pour slowly into running blender until it visibly thickens. Add salt to taste, if necessary. Heat broiler. Top each oyster with about 1 teaspoon of kimchi and fill with Hollandaise. Broil until sauce is nicely browned, and serve immediately. Serves 8–12.